← Friday Five – Taxes! The Shenandoah Valley is a low spot between the two mountain ranges – the Blue Ridge on the eastern side and the Ridge-and-Valley Appalachians on the western side. 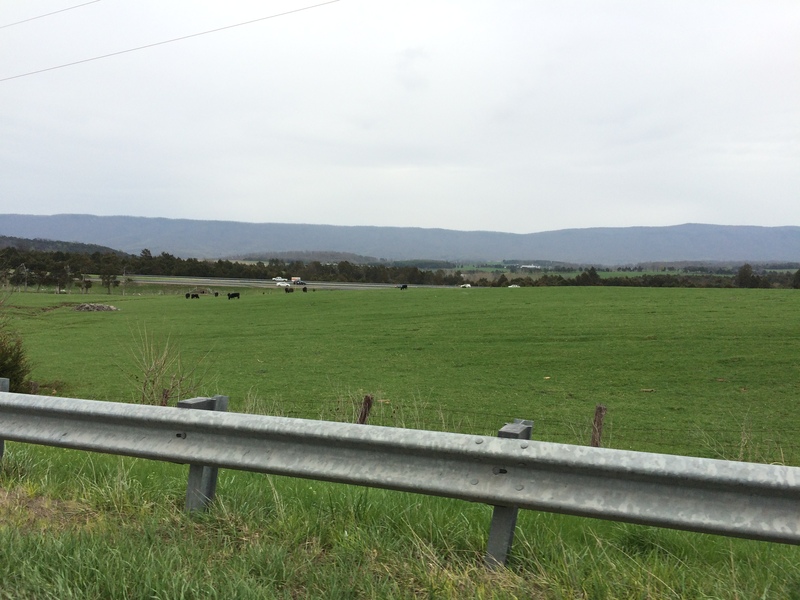 The Shenandoah Valley is bounded on the north by the by the Potomac River and on the south by the James River. The red lines in this clip from Google Maps, with the Terrain feature turned on, show the western and eastern sides of the Shenandoah Valley. The arrow at the top points to the Massanutten Mountain which bisects the Shenandoah Valley between Strasburg, VA in the north and Harrisonburg, VA in the south. 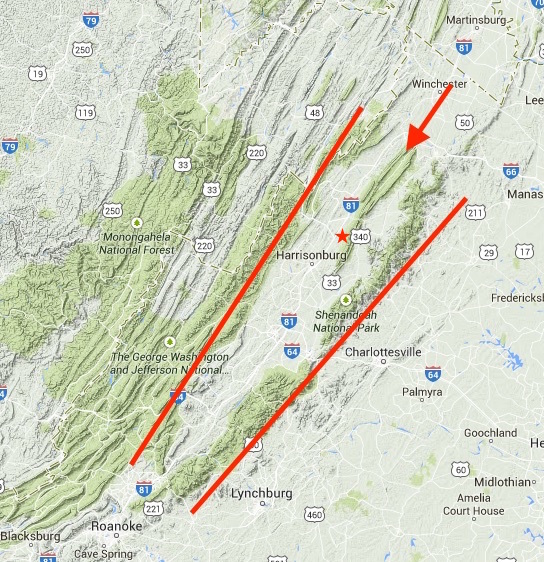 The small red star just above Harrisonburg is our location in the valley. So what does the valley look like up close? Typical roadside wild flowers and lush green grass. 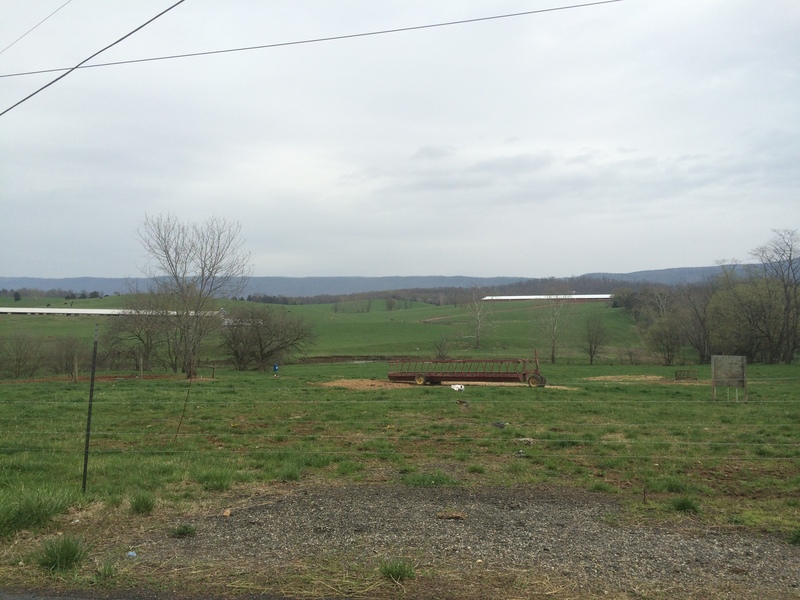 The two long white roofs are barns for a local turkey farm (looking west). There are a couple of Civil War (1861-1865) battle fields nearby. We have yet to explore the Battle of New Market which took place May 15, 1864 and the Battle of Piedmont which took place June 5, 1864. There are also several caverns that we need to explore. The Luray Cavern (discovered in 1878 is a registered National Natural Landmark. The Shenandoah Cavern is the only one with elevator access. This makes the cavern accessible to those who are wheel chair bound. The Endless Caverns is one that was discovered by two boys out on a rabbit hunt. The Grand Caverns is also a registered National Natural Landmark. Needless to say, there are plenty of things to do and see in the Shenandoah Valley that are an easy day trip from our location. 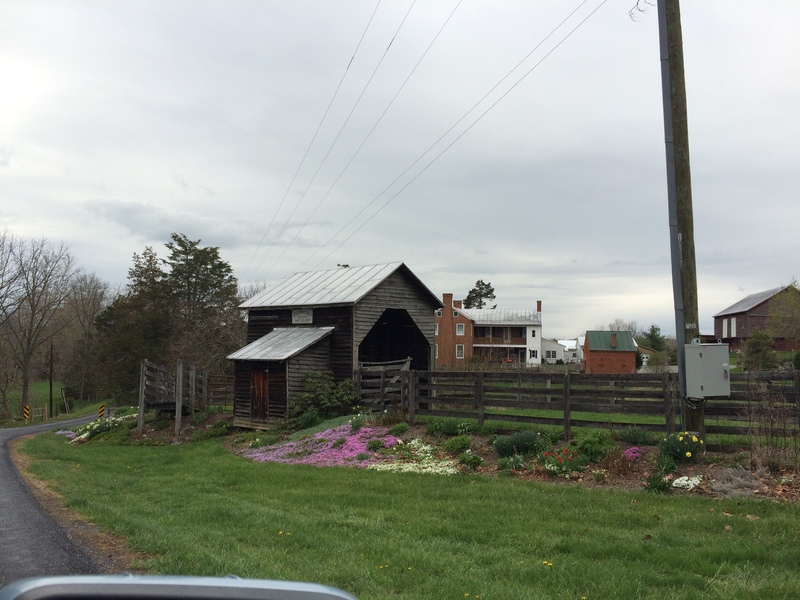 This entry was posted in Travel, Virginia and tagged Battle of New Market, Battle of Pioedmont, Endless Cavern, Grand Cavern, Massanutten Mountain, Piedmont, Shenandoah Cavern. Bookmark the permalink. Sounds like there’s plenty to keep you interested during your free time off Jerry. Are your duties heavy and will there be much time off for you to enjoy? Carol is working part time so she has plenty of off time. My work load will vary depending on what needs repairing. It looks like we will have two days off each week. The RV park gets into full operation May 08 starting with Mother’s Day weekend. Then it will be pretty busy until Labor Day in September. You’re also pretty close to Monticello and a host of other historical sites near Charlottesville. Just take care going “over the mountain” at Afton, definitely not a RV trip. There are a lot of orchards, wineries and fresh food around the entire area. Thanks Lynda. We will be making a day trip to Charlottesville next month for Cody’s annual vet check up with Banfield. Monticello is on the radar.